UNITED NATIONS, September 9 -- The Palestinian Authority has said it will hand a request to UN Secretary General Ban Ki-moon on September 20. But disgruntled UN officials tell Inner City Press that Ban has sought a legal opinion from his top lawyer, Patricia O'Brien, that he is not required to immediately pass the request on, and can delay it. These officials say that O'Brien has responded with just such a memorandum. Inner City Press has repeatedly asked that O'Brien, like nearly all other UN Under Secretaries General, come and take press questions, on a range of issues now including this one. 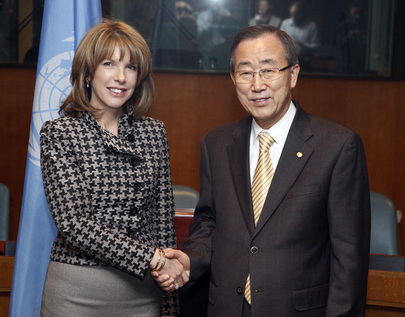 She has refused, and neither Ban Ki-moon nor his spokesperson's office have tried or been successful in persuading her that providing some public explanation is part of the job of being the UN's top lawyer, that even her predecessor Nicolas Michel did. Inner City Press: I had asked you this thing about the ICC (International Criminal Court) question, I asked it again to Mr. Deiss, what is the role of the Secretary-General if a country becomes an observer State and the UN takes the document for the joining of the ICC, is it automatic or does he have some discretion, maybe you don’t have the answer yet today, but I wanted sort of it’s coming right up [to] this being a live issue. Deputy Spokesperson del Buey: No, but I think the best thing to do, Matthew, is to ask the ICC. Inner City Press: The UN definitely has a role. I mean, two Member States have said the paper gets filed with the Secretary-General; one has said he has some discretion, the other one says he doesn’t. So I just wanted to know what he understands, or Patricia O’Brien of OLA (Office of Legal Affairs), who we’ve repeatedly asked to come give a briefing, what her understanding of the legality of the Secretary-General’s role because it is more important, it’s, it’s important what the Secretariat thinks its role is, not what the ICC thinks your role is... it’s Ms. O’Brien, but we’ve asked to have a briefing, she hasn’t come, maybe this one question can be answered by OLA? Deputy Spokesperson: Well, we’ll see whether what we can get for you.